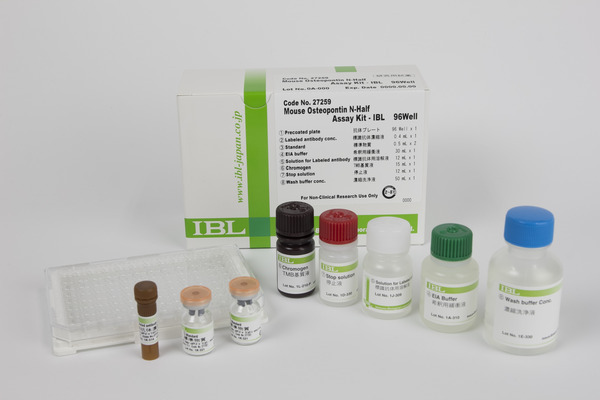 Osteopontin (OPN) is a secreted glycoprotein that was originally isolated from bone. At present, it is known as a highly acidic calcium-binding glycosylated phosphoprotein secreted by many cell types, including osteoblasts, kidney tubule cells, macrophages, activated T cells, and vascular smooth muscle cells. Its molecular weights have been reported in the range of 66 kDa to 44 kDa depending on glycosylation and phosphorylation. One important feature of OPN is that it contains an Arg-Gly-Asp (RGD) amino acid sequence. This motif is present in fibronectin, vitronectin and a variety of other extra cellular proteins that bind members of the integrin family of cell surface receptors such as αvβ3. Another important of OPN is is the presence of various molecular forms in vivo due to differential RNA splicing, glycosylation, phosphorylation, sulfation, and susceptibility to proteases. Both OPN and thrombin are likely to be localized together at the site of injury, in- flammation, and angiogenesis and in tumor tissues. Osteopontin is susceptible to proteolytic fragmentation, and this process may have physiologic importance. A report demonstrated that thrombin treatment enhanced OPN cell adhesive activity, suggesting that cleavage of OPN by thrombin exposes a cryptic adhesive sequence. More recently, it was shown that an aminoterminal OPN fragment contains a cryptic binding site that can be recognized by α9β1 integrin. Furthermore, OPN contains multiple cell binding sites and interacts with various receptors; these interactions may have distinct functional. 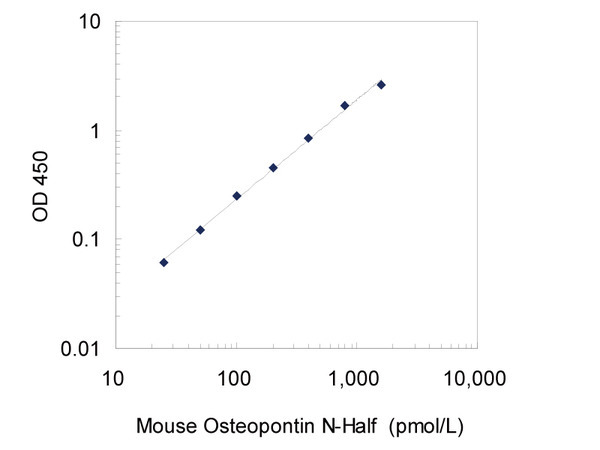 The kit can specifically assay for N-terminal fragment of thrombin-cleaved Mouse OPN (OPN N-Half), and almost can not detect Mouse OPN molecule not cleaved.